You’ve got an instrument or effect running in Pure Data, for free, on your computer. (If you don’t know how to do that, more in a moment.) Leave the computer at home. Play that sound creation on your iPhone (or iPad). PdParty goes the furthest yet. You patch normally in Pd. Once you’re thinking you’ll run a patch on the iOS gadget, there are templates that help you adapt to that scenario – with audio in and out, and the appropriate screen layouts. Choose those widgets you want for the UI, organize them so they’ll fit on the screen, and wire up sound and make some minor adjustments, and you’re good to go. Your iOS device then runs a server that lets you load onto the phone/tablet. But wait – there’s more. PdParty adds some features on top of that, some inspired by RjDj and PdDroidParty, but some new. Custom widgets make it easy to adjust audio input level, turn on or off sound operation, and start or stop recording of whatever you’re doing (perfect for capturing ideas). Play back files via a prepared widget. OSC. Send and receive OpenSoundControl messages. MIDI. Send and receive MIDI – now, that works with other apps, with connected hardware, and over a network to a Mac (that should be hackable to PC, too). Game controllers. MiFi game controller input support works, too, on top of those MIDI gadgets. Use sensors. You can also read data from the iOS gadget’s various sensors – that includes motion, location, and other inputs. Backwards compatibility. Out of the box, you can add scenes from tools like RjDj. Native widgets for UI. Basically, Pd sliders and checkboxes and knobs all work on the iPhone. It’s the next best thing to running Pd directly (which isn’t possible — yet). Why, Dan Wilcox would. 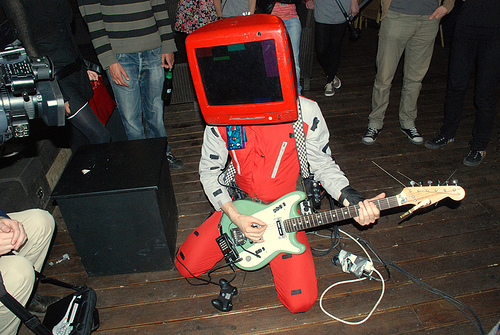 The need to do so became apparent because Dan was regularly in the habit of dressing up as a robot and running around parties playing music. Clearly, strapping an iPhone or iPod touch to a belt then makes loads of sense. This is definitely for people interested in Pd patching. But it could also be a fun way to start learning. You’ll want to work with vanilla Pd patches, but you can add rjlib. Actually, even if you’re not terribly good at patching, you can use rjlib as a free library of lots of cool synths and effects and so on, plus a mess of abstractions that make life easier. If you have a tutorial in mind, though, I’m thinking of writing a simplified one. It could be a nice way to celebrate 20 years of Pd. And if you’re in New York, later this month there’s a conference.